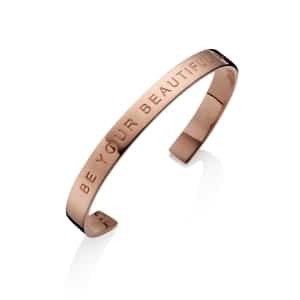 Engraved with the words, ‘Little by Little, Day by Day’, the Courage Mantra Bangle is designed to inspire, hearten, and give encouragement to those who need it most. Beautifully handcrafted in the finest sterling silver and plated in warm gold vermeil, it is the kind of bangle that you can wear every day and never tire of its simplistic styling and uplifting quote. A stunning jewellery gift for friends and loved ones who are currently facing one of life’s many challenges, our Gold Courage Mantra Bangle will let them know that they are not alone, and that you are with them every step of the way. Adjustable to fit all sizes. Supplied in an Under the Rose gift box.